Another glorious spring day in London, with temperatures hitting 18 centigrade (hotter than Jerez and Corfu, for example). But given the unpredictability of the weather these days, it could be snowing later in the week! 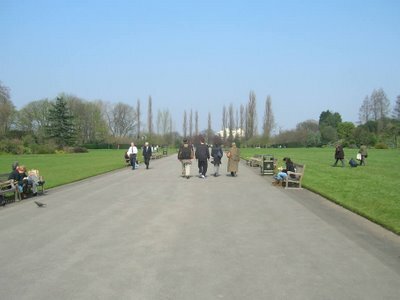 Pictured is Regent's Park about an hour ago. Forgot to mention some nice wines had over the weekend, at a lovely dinner party hosted by a rather good chef. The deal was that I should bring the wine. With goose foie gras we had Aigle Blanc Vouvray Moelleux 1990 - I was worried this wouldn't be sweet enough, but it worked very well. With asparagus and truffle cooked in butter we had Louis Jadot Meursault 2003: the fatness and richness of this wine worked well, with what is traditionally a difficult pairing. With a veal main course it was the turn of a 1989 Penfolds St Henri. This was the first vintage that St Henri was labelled 'Shiraz Cabernet' rather than 'Claret', and it was drinking perfectly. Age has turned this wine into something elegant, dark and thought-provoking.